This delightful cabaret recital owes its origin to a Spitalfield’s Festival concert, when Catherine Bott enchanted an audience with a whistle-stop tour of the capital in song. The programme has subsequently brought delight around the country as a whole, and is now available for all to hear. From Noel Coward to William Walton, from Mayfair to the Isle of Dogs, there is something here to bring a tear of reminiscence to anyone who has ever cared about London. There are two people whom I must thank for the creation of London Pride: the composer Jonathan Dove, who invited me to devise a cabaret for London’s Spitalfields Festival in 2002; and the late William Blezard, Joyce Grenfell’s accompanist of many years, who so kindly let me roam through Grenfell’s musical repertoire one day. She, of course, was one of the most beloved and inimitable English entertainers of the twentieth century, and it would be foolish to try to re-create her sublime performances. But there was one unfamiliar masterpiece among all her famous songs: Joyful Noise is a miniature baroque cantata, written in 1951, which celebrates the British amateur chorus with love and humour. It is also the only collaboration between Grenfell and the pianist and composer Donald Swann, later famous for his partnership with Michael Flanders. I have sung a few baroque cantatas in my time, and this one was irresistible. Joyful Noise was obviously essential for my Spitalfields cabaret, and its setting is London’s Royal Albert Hall. So why not take London as my theme? Jonathan Dove gave the go-ahead and I started making lists. Luckily, London is one of the most written-about cities in the world when it comes to song: it’s up there with New York, Paris and Rome. I decided to try to avoid the generic ‘Good old London Town’ sort of number and concentrate on songs about individual areas and locations. What beautiful-sounding places there are in and around Greater London—Crystal Palace, Nine Elms, the Isle of Dogs, Silvertown, Mayfair, Covent (Convent) Garden, the Strand …. Well, Londoners know that a lovely name doesn’t guarantee anything and, inconveniently for my cabaret, there are large areas of our capital city left untouched by composers. But as my researches continued, a (partial) tour of London in song became the foundation of the show. We begin by riding from Chalk Farm to Camberwell Green on that iconic vehicle, the London bus (red buses and black taxis define London for cinema audiences all over the world—just watch A Fish Called Wanda or any Richard Curtis film). And back again immediately, as the heroine of the song has been enticed south of the river under false pretences. I was determined to include one of John Betjeman’s London poems, and Madeleine Dring’s beautiful setting of Business Girls shows us the loneliness of single life in Camden Town. Next we move south a little with the sparkling duet A Room in Bloomsbury, from Sandy Wilson’s adorable ’20s musical The Boy Friend. And while we’re in Bloomsbury, we can’t leave out George and Ira Gershwin’s mention of the British Museum in A foggy day in London town. William Walton’s Rhyme is a song of the City of London. A setting of the old children’s game Oranges and Lemons, with a lyric crammed with London churches and their bells, it’s the last in his cycle A Song for the Lord Mayor’s Table, composed for the City of London Festival in 1962. 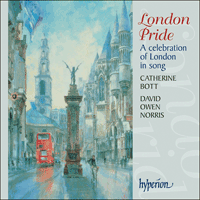 Composed especially for London Pride in 2003 by David Owen Norris, Big Ben Blues is a macabre contrast to the romance of Gershwin’s view of London, and takes us as far as the River Thames. South of the river now, to the oldest song in the programme, and the only location that no longer exists. Vauxhall Gardens was the most popular and long-lasting of all London’s pleasure gardens, where one went to see and be seen throughout the eighteenth century. William Boyce’s song The Pleasures of Spring Gardens, Vauxhall tells us why. One of the happiest things about London Pride is that it makes perfect sense to juxtapose concert hall with music hall, a song by William Walton with a blues by David Owen Norris, Boyce’s Georgian ballad with a sensual song cycle by Jonathan Dove. Published in 2001, Five Am’rous Sighs evokes eighteenth-century metropolitan life in settings of poems by Lady Mary Wortley Montagu and Matthew Prior. For a singer like me, more used to dead composers than living ones, it was a great pleasure to give the first public performance of this gorgeous piece in the presence of its composer in that first London Pride performance at the Spitalfields Festival. I wanted to include something about that vague but vital element of London life, ‘the season’, so I got in touch with those wickedly observant chroniclers of modern urbanity, the cabaret duo Kit and the Widow. They, like William Blezard, kindly let me rummage through their repertoire for something suitable for a soprano to perform, and I found the perfect number—Wimbledon Idyll, in which a well-bred lady lets her excitement get the better of her. Staying with the gentry, it seemed a good idea to revive A A Milne and H Fraser-Simson’s They’re changing guard at Buckingham Palace, known and loved/loathed by generations who heard the original precocious recording. Our tour of the metropolis in song, which started in the north and progressed through the City to the river and points south, is by now exploring what Londoners from other parts tend to call ‘up West’: Belgravia and Mayfair—the Mayfair merry-go-round, to be precise, which is recreated in a tour de force of playing, singing and musicology by pianist and polymath David Owen Norris. One of the most important musical genres associated with London is the music hall song, and this needs careful handling by a classical singer. Stick your thumbs through imaginary braces and bellow ‘Let’s all go down the Strand’ and your audience will recoil in horror before you can say ‘Knocked ’em in the Old Kent Road’. But music hall was once a hugely popular part of London life, and its best songs have a comic or sentimental appeal that still entertains and convinces. Victorian Londoners were less afraid of sentiment than we are today (were they, in our modern phrase, more ‘in touch with their feminine side’?) and, keen philanthropists that they were, enjoyed wistful songs about homeless waifs and strays. One of the finest of these is Harry Dacre’s While London’s fast asleep. Let’s not forget that there are still, in the twenty-first century, pockets of the most abject poverty in London. That song reminds us that, delightful though London is, it’s not perfect—in fact, who hasn’t at some time contemplated joining Richard Rodney Bennett in saying Let’s go and live in the country? But somehow, true Londoners can’t keep away. Nobody could leave a city where, on one romantic night, A nightingale sang in Berkeley Square, or where a ride in a taxi can be so arousing—Take me in a Taxi, Joe was a speciality of Vesta Victoria, whose other innuendo-filled hits included It didn’t Take Long to Come Off and, most memorably, Daddy Wouldn’t Buy me a Bow-Wow. Now for the piece that began the whole project—Joyce Grenfell and Donald Swann’s blissful and utterly baroque Joyful Noise. As an experienced early music singer I’m aware of the tendency towards ‘authenticity’ in oratorio performances these days. Forces are small, choirs usually comprise a couple of dozen hand-picked young professionals. But this cantata proclaims the wonders of the old-fashioned amateur chorus, vast in number and boundless in enthusiasm. I’m happy to proclaim it too, as one of the most uplifting sounds in sacred music and a glorious English tradition. London Pride was written in the spring of 1941. I was standing on the platform of a London railway station on the morning after a bad blitz. Most of the glass in the station roof had been blown out and there was dust in the air and the smell of burning. I watched Londoners scurrying about in the thin spring sunshine—they all seemed to me to be gay and determined and wholly admirable and for a moment or two I was overwhelmed by a wave of sentimental pride. The song started in my head then and there and was finished in a couple of days. The tune is based on the traditional lavender-seller’s song ‘Won’t you buy my sweet blooming lavender’. I am proud of the words of this song. They express what I felt at the time and what I still feel, i.e. London Pride. I share his sentiments—I’m a Londoner by ancestry (three of my grandparents were born here and one of my great-grandfathers was a gamekeeper in Bushey Park) and I’ve had a home in London ever since I first came to study at the Guildhall School of Music and Drama. Devising and performing this celebration of London in song has been one of the happiest experiences of my whole career, and so far London Pride has been appreciated by sophisticated metropolitan audiences, by people all over the UK and most recently in Amsterdam, proving that it has something to say to anyone who lives in London, has ever visited London or may be homesick for London. As Dr Johnson almost said, when a woman is tired of London, she is tired of life. I hope you enjoy London Pride.